This is what happened when the kids fought over one of their toys. A lesson learned the hard way. Oh no! Poor Cinderella! 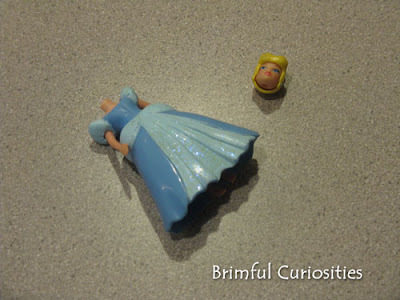 Isn't she supposed to lose her shoe, not her head?! Oh no. Is that a Poly pocket ? My daughter would be devestated. That is funny! My daughter does that to her toys too. Reminds me of Sid from Toy Story! nope she ain't singing at all right now... she looks a little in shock. Poor Cinderella! To be decapitated and left on the carpet! lol Thanks for dropping by my blog & have a great week! My 5 year old son saw the photo. I asked him what it was. He answered and then wanted to know what happened. Lesson learned for him as well. LOL My girls do the same thing! OMG... I love it, I laughed out loud, I made the hubs come and look at this... too funny! !